Thousands of educators and technology professionals from around the world are converging at the 36th annual Future of Education Technology Conference (FETC) in the Orange County Convention Centerto peer into the future of classroom technology. As one of the largest ed-tech conferences, FETC provides pre-K – 12 educators and administrators the opportunity to explore the integration of technology across the curriculum through hands-on exposure to the latest software and successful implementation strategies. Reshma Saujani,Founder and CEO of Girls Who Code, kicks off the conference as the Opening Keynote speaker. She will discuss bridging the gender gap in technological learning and Science, Technology, Engineering and Math (STEM) education. FETC STEM Innovation and Keynote speaker, engineer and astronaut, Leland Melvin will present the importance of pursuing STEM careers. Also, FETC will recognize excellence and innovation in the field of science, technology, engineering and mathematics education at the primary, middle and high school levels at the second annual STEM Excellence Awards. The conference will feature more than 400 exhibitors including Florida Shines, Insight Systems Exchange, National Science Foundation, Scantron, Microsoft, Lenovo, Symballo Edu, Aver and Epson. 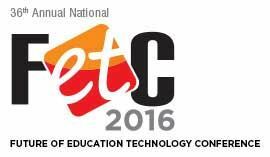 Learn more about FETC at www.fetc.org.